Over the Christmas holidays we received an email from Julien Marin. He wanted to tell us about the Malinux Télé project, which he founded a year ago in Mali in West Africa, and to reach out for concrete help from the Raspberry Pi community. 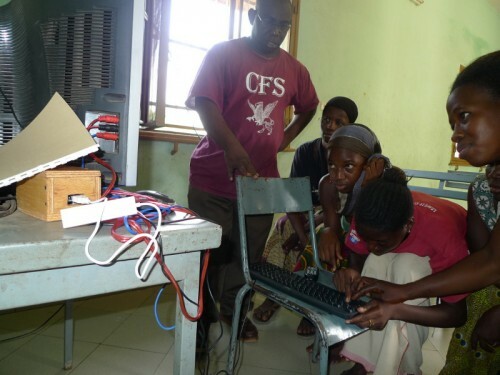 As a volunteer for a Malian children’s charity, Julien had observed a problem that we’ve seen in various guises elsewhere: a computer is seen as far too precious to let children use it, even if it has been donated, and this is especially true for organisations taking care of disadvantaged children. 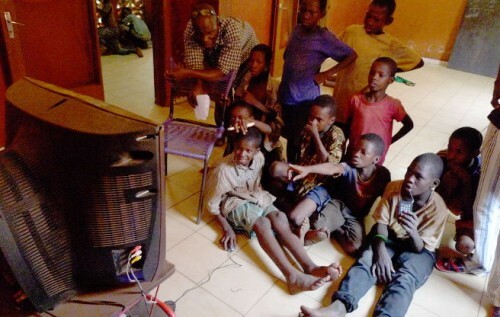 Televisions, however, are much more common devices, and most childcare settings in Mali have a TV that children can use. This means that Raspberry Pi offers a way to bring educational software where isn’t possible to bring conventional computers. Malinux Télé devices include a Raspberry Pi with the Malinux Télé operating system, a specially designed fork of Raspbian that bundles educational software, offline copies of resources such as Vikidia (a wikipedia-like encyclopedia for children), and activities allowing children to practice reading in both French (Mali’s official language) and Bambara (the children’s native language). It’s configured to display correctly on an analogue TV connected via the Raspberry Pi’s composite video port, as well as to make using the device as simple as possible for people who haven’t had much practice using computers or controlling a mouse. The Pi and SD card are enclosed in a wooden case made by artisans in Mali, designed to stop SD cards from being too easily removed and ending up in children’s mobile phones! 75% of the population of Mali have no mains electricity connection, and this set-up can be powered by alternative means such as solar panels. These are just perfect for the Malinux Télé project: suitable cables can be found in the local market. 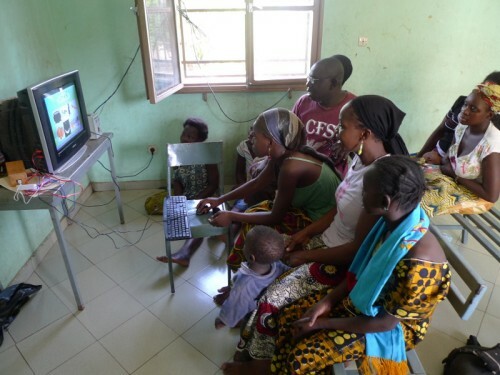 We decided to ask people for donation of unused Pis so they can have a second life making the malian children happy with the Malinux Télé project. We were really glad that Julien got in touch to let us know about Malinux Télé: it’s an excellent, simple idea that makes the most of the work and resources of existing local organisations, and we hope you’ll like the fact that there’s an easy, concrete thing you can do if you’d like to help. If you have an old Raspberry Pi that’s sitting around gathering dust, consider giving it a new lease of life in Mali. What a great project! It is always great to inspire the young and especially the poor. This is something that would really make a difference to their lives, brighten them up. They don’t have what we have and you are giving them the opportunity to learn about the modern world. Well done and I hope this project goes really well so we can give everyone the chance to express themselves. Hi, Just wondering how to donate some old Pi’s ? I’ve looked at the website but cannot find any info about HOW TO donate! Please help! I have a few Pi’s laying about! It’s right there on the page that’s linked from the bottom of the post you’re responding to: there’s a postal address you can send them to. Would you also find useful the first rev 1.0 Pi B with 256MB RAM? I see you have GCompris etc. there, which may not run well with 256MB. Gcompris and all educative software runs fine with 256MB Ram (we removed any service not usefull to our purposes). Also the memory split is only 16mb of video Memory, since we display on TV and don’t need video acceleration for educatives games. When i read your article it remember me the goal of the fundation and I totally don’t understand raspberry 2 and zero appeal. Since raspeberry 2 is more expensive that the one and the zero don’t have the standard interface to be usable on country like that (standard usb, ethernet and analogue port). For the zero if the target is the industry (small size clue) i think that hdmi is useless and embedded wireless technology (wifi,bluetooth) shall be present to don’t have a hidden additionnal cost. I hope that the fundation will return to it’s first philosophy. I think perhaps you’re misunderstanding how we work. We sell devices to raise money for our charitable foundation. Doing so at low cost means that more schools everywhere can afford computing. That foundation teaches teachers, provides free learning materials, funds Code Clubs for kids, and much more. Raspberry Pi didn’t become more expensive when we launched Raspberry Pi 2, by the way; the Pi 2 went on sale at $35 (plus taxes and shipping), exactly the same price as the previous model, the B+. Since then, we’ve dropped the list price of the Model B+ to $25. The cost of the latest Raspberry Pi Model B is $35, just as it was a year ago, and just as it’s been since we launched the original Model B back in 2012. From my side, i see the raspberry pi zero as a good new. can you provide links to those cheap usb hubs and usb sound cards? i would be interested in those. what’s the sound quality of such sound cards? better than the analogue output of a raspberrypi pi 2? comparable to pidac? i guess not? 1. The computer teaches the student. 2. The student programs the computer. 3. The use of specific applications. The Raspberry Pi was developed to reverse the trend where category 2 had been essentially eliminated from schools in developed countries. Programming a computer, whether to make a game, control a robot or solve mathematics and science problems, is possibly the most liberating of the three uses of computers in education. Just as the ability to read and write revolutionized society in previous centuries, widespread computer literacy in terms of reading and writing computer programs could change the future. Today we think nothing of reading a menu in a restaurant, however, not that many centuries ago the idea of a menu was useless. Indeed, traditional literacy is below 50% in Mali. While there have been recent breakthroughs in computerized grading of student essays, how good could a computer really be at teaching someone to write? Learning multiplication using a video game may seem like a good idea, however, drill and practice of multiplication tables with an interested grand parent or older sibling far exceeds what a computer can provide. In the industrialized world letting a computer teach such subjects has a significant potential to marginalize students by making them feel not worth another person’s time. Interacting with real people provides attention and encouragement that is vitally important for maintaining interest and builds essential social skills while bonding people together. From the website, writeup and video clip it would seem that MaLinux is focusing on category 1 where the computer teaches the student. In the developing world this may make students feel important, as there is a notable scarcity of computer technology. At the same time, it is generally accepted that to leave poverty one has to reach for the stars. This is, for example, the thinking behind the space and technology programs which appear to be working in India and China. Therefore, teaching computer literacy is important, even when there are other obvious deficiencies in education. Along these lines, I did not see icons for Scratch, Python, Minecraft or Sonic Pi on the MaLinux desktop screenshot. Having these these packages loaded in the default install is important to support student learning of how to program a computer. As almost every country is below 10% in this kind of computer literacy, there is no reason why children in Mali would find programming harder than children in any other country. Hopefully, these packages haven’t been removed, and if they have, they can be put back so the students in Mali can learn how to program computers using the Pi. I agree that learning programming a computer is a very liberating experience. But this needs a trained adult to be here with children. This involves creating sort of computing lab with many pi in the same room so so the trained adult can explain programming to children and each child can manipulate with one pi. Malinux Télé devices are given one per association taking care of children in difficulty (using the TV these structure already have). Some times more than 50 children will share it (using it in group, or each one when it turn comes). The educators there may help a child choosing an activity to practice it’s skills in reading or maths, but doesn’t have a lot of time to spend with the children using malinux tele, and does’nt have skill to teach computing… This configuration a very different with the case of a computing lab with a trained adult here dedicated to teach computing. Teaching programming need means we didn’t had for the malinux Télé project. Also using scratch on a TV screen is difficult… In this condition it was very improbable that some children will benefit from scratch… So we removed it to gain space to put other thing (like putting an encyclopaedia). Also Malinux tele doesn’t pretend to replace adult in the task of teaching, it just pretends an additional tool to help adults in this task. Félicitations, Julien ! What a wonderful initiative. I’ve heard about the potential of Raspberry Pis in innovative literacy programs, and I am hoping to learn more about the technology. I will write to you separately, Julien, to find out how I might be able to provide support with content in French. Bonne continuation ! wow! This is simply amazing. I am an engineering student in Pakistan and am looking for ideas for my raspberrypi project. I just love this one! I am thinking to do a localized version of this as my project. Can I please use this idea? Also, I’d love to get connected with the person who initiated this project.